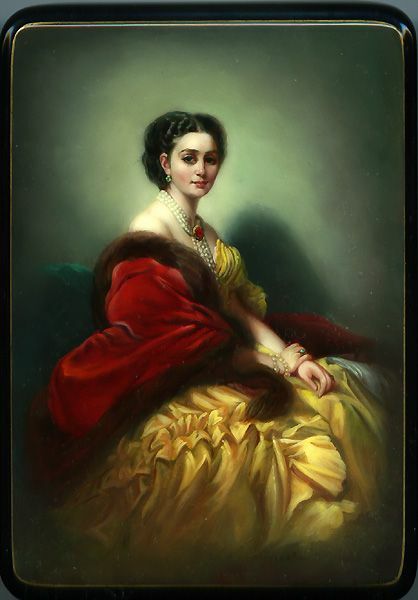 This exquisite portrait of a beautiful lady, was painted by Alimpiada Dokuchaeva of Fedoskino. She is a wife of well-known artist Yevgeniy Dokuchaev. She has finished Fedoskino Art School in 1966 under the guidance of talented teacher Nikolay Marchukov. The portraits like this one were very popular at the beginning of the ninetieth century. At that time P.V. Lukutin factory produced a large quantity of lacquered boxes depicting young beautiful ladies. This piece is truly a work of art, from top to bottom! Here the artist has combined brilliant skill with oil paints in shading, coloring, texturing, and a gift for realism. The scene is framed with a gold line. Two parallel gold lines decorate the box's sides. The box is constructed from paper-mache. Black lacquer is used to paint the exterior of the piece while red lacquer completes the interior of the box. The lid is hinged from the left side of the composition, and the box rests on a flat bottom. The work is signed by the artist.